Looking for old-school Gothic Horror? 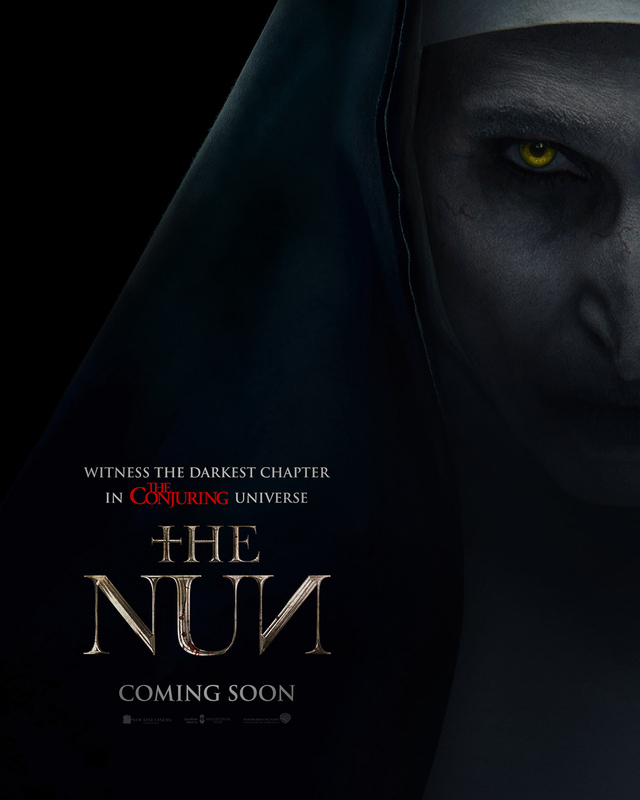 THE NUN has everything - a period setting, an old castle, stone walls, dark corridors, shadowy sepulchers, ghosts, demons, and a climactic battle between Good and Evil - everything, that is, except a worthwhile plot. Fortunately, the film has enough creepy atmosphere to fill the void in the script - especially when seen in the new ScreenX format. In a Romanian convent, seven years after the end of World War II, a young nun kills herself before an unseen evil force can use her body as a vessel to escape the convent. 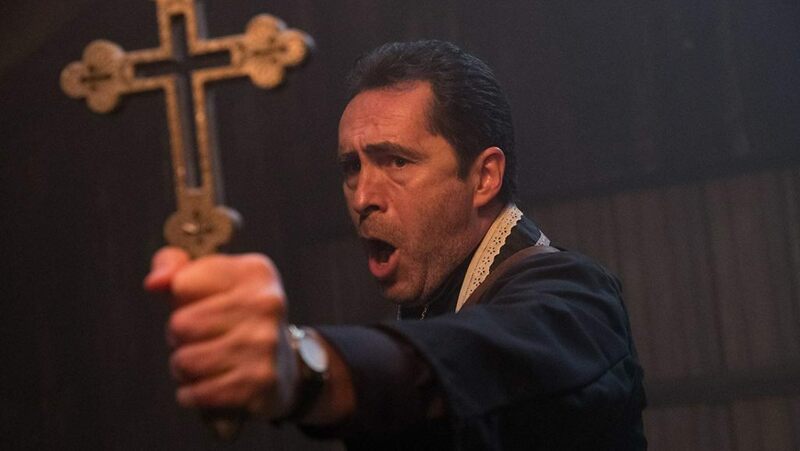 The Vatican sends Father Burke (Demián Bichir) and Sister Irene (Taissa Farmiga) to investigate. In any case, Burke and Irene's investigation consists mostly of wandering through the convent (a former castle, built by an evil nobleman), so that spooky things can haunt them. Many jump-scares later, they learn what we already know - about an evil force that needs a vessel to escape the castle - but they never really learn much useful about how to defeat the demon. Fortunately, this doesn't matter, since the film is more than eager to overwhelm viewers with an exciting battle royale in the basement of the castle, with the priest and the novitiate confronting the demon with the help of a local man named Frenchie (Jonas Bloquet). It's a knock-down, drag-out fight that fully satisfies audience craving for some visceral thrills to add icing atop the shadowy horrors that fill most of the running time. So to sum up: The Nun has a catchy prologue and an entertaining ending. The middle act is the problem. You may have noticed that the synopsis says little about the titular Nun (Bonnie Aarons). Why? 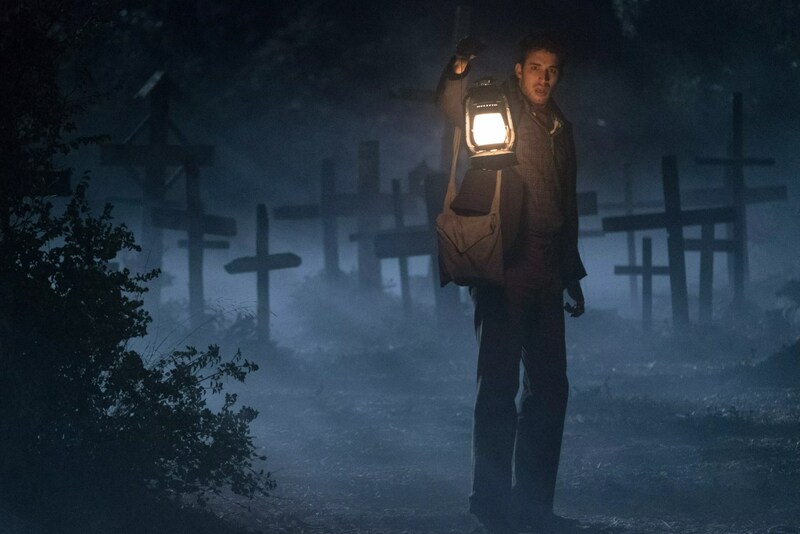 I am not a big enough fan of this particular franchise to care strongly about how well this prequel dovetails with The Conjuring (2013), but The Nun largely feels like a generic horror script that was retrofitted into the pre-existing continuity. The story is essentially a riff on The Keep (1983), with an evil force locked inside a Central European castle, potentially unleashed by the effects of the WWII: in this case, the demon had been contained long ago, but an Axis bombing raid reopened the gates to Hell. The evil force is often referred to as a demon; its appearance as a nun is explained as camouflage, used to move about the convent unnoticed (not that the demon is particularly low-key about its presence). This makes a kind of sense but raises an obvious question: once the demon is out of the convent, why would it continue to appear as a nun in the other Conjuring movies? Really, the script would work much the same if the demon were not The Nun, if Taissa Farmiga were not playing a younger version of the character her sister played in the previous films, and if there were not a last-minute revelation regarding the name of one of the characters. Not that these connective tissues hurt; they simply add little, except to give the otherwise generic story line a box office boost by associating it with a successful series. A foggy graveyard - yes, have you seen this before. If you're a fan of horror movies, The Nun does everything it can to get on your good side, quoting classic and cult films alike. Besides the aforementioned resemblance to The Keep, the use of a WWII bombing raid to resurrect a previously dispatched evil is reminiscent of 1943's Return of the Vampire. The artifact containing the Blood of Christ seems to have rolled in from the set of Tales from the Crypt: Demon Knight. And Father Burke's unfortunate experience of being buried alive comes to an end when his rescuer's shovel cracks through a coffin lid and nearly splits his skull (a la 1980's City of the Living Dead). So, was the ghost actually trying to help Burke, not kill him? Or was the boy's spirit thwarted by other ghosts? And if so, why do ghosts work in such circuitous ways? If Irene has the ability to see the supernatural world, can't they simply communicate with her directly; isn't that why the Vatican sent her? Come to think of it, why don't the nuns of the convent spill the beans the second Burke and Irene arrive? The script provides a lip-service answer: the nuns guard their privacy doggedly, but considering that their order exists precisely to contain the evil inside their convent, they should rethink their priorities. To be fair, there is a little bit more going on here, but it's impossible to reveal without spoilers. Let's just say that the film's carefully choreographed presentation of the nuns (usually in shadows, with faces hidden, almost always one at a time, interacting with Burke or Irene but almost never with each other) should drop enough subtle hints to prepare you for the inevitable revelation. Which, unfortunately doesn't answer the question about the nuns' silence but circles back to a previous question about the circuitous communication strategies of ghosts. 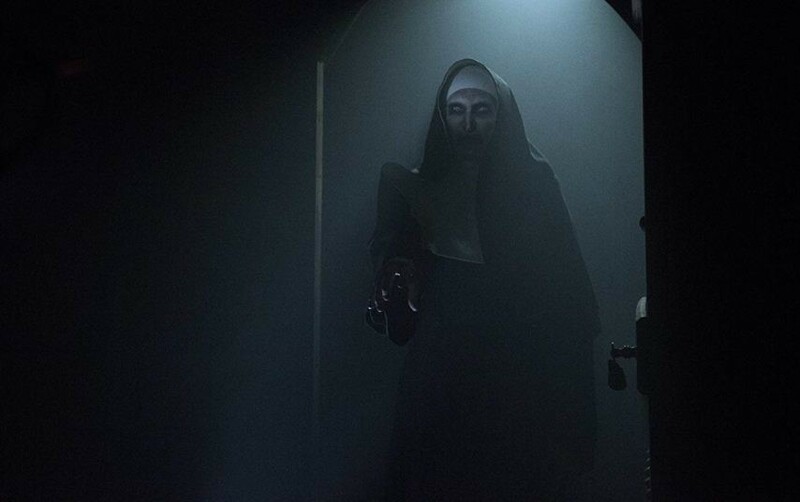 The above comments may sound like a dismissive avalanche of negativity, but in spite of the deficiencies in plot and logic, The Nun is actually more fun than it had any right to be, in a mindless, popcorn scare-show kind of way. The gratuitous horror set-pieces serve no dramatic function (Father Burke is never going to resolve his guilt over the dead boy haunting him); nevertheless, they are executed like brilliant little mini-movies. Burke's trek to the graveyard, where he is involuntarily interred, sweeps the audience along with him, gradually building intensity until he is toppled into the open grave. The sequence creates a sense of spiraling chaos with, ironically, an almost mathematically precision; the climactic shot of the tombstone above Burke's grave is perfectly placed like an exclamation point at the end of a particularly intense sentence. The impact of these sequences is multiplied almost literally three times in the new ScreenX format (available in select theatres, such as the CGV Cinemas LA). ScreenX mimics and magnifies the effect of the old three-camera Cinerama format, which used a wide, curved screen to fill the audience's peripheral vision, making viewers feel as if they were in the middle of the action. ScreenX takes the concept a step further: instead of a curved screen, it turns the left and right walls of the theatre into additional screens. More than Cinerama ever could, ScreenX surrounds the audience, immersing them in the movie's fantasy world. The process seems as if it would be better suited to action blockbusters, but it works surprisingly well in an atmospheric horror film. The viewer feels almost side-by-side with the characters, walking with them through crypts and cemeteries. ScreenX is particularly effective for a staple of the horror genre: the long tracking shot advancing slowly down a dark corridor. The front screen shows the approaching destination while the left and right screens show the walls sliding by inexorably. These shots have always been designed to provoke audience cringing - shrinking back as if trying to avoid going through the door at the end of the hall - but the effectiveness is magnified magnificently in ScreenX. There is also an almost subliminal effect to the use of ScreenX in The Nun. As director Christopher Nolan used IMAX only in particular sequences of The Dark Knight, director Corin Hardy limits use of ScreenX in The Nun to the showstopper scare sequences; in particular, process kicks in only when the supernatural is onscreen or within the immediate vicinity of the characters. Consequently, when the side screens light up, they act like a little warning bell in the back of the viewer's mind, warning of approaching horror. Since only a handful of theatres are equipped to show The Nun in ScreenX, by necessity vital visual information is always displayed on the front screen; the side views are reserved for the surrounding scenery. Nevertheless, this can be quite effective, as when one of the characters finds himself surrounded by shrouded figures, who fill three walls of the theatre space. In the audience, we can relate to the hapless human's inability to keep an eye on everyone around him, because we cannot keep an eye on all of them either. This particular sequence reveals the one flaw inherent in ScreenX (which afflicted Cinerama as well); with the audience in the middle of the action, a character on the right screen cannot directly move to the left screen but must instead circle around via the front screen. The film is pretty subtle about hiding this; only someone looking for it would notice, but it happens as the camera tracks to follow the character through the figures, one of which moves from left screen to center screen to right screen. These screen-to-screen transitions are less noticeable when depicting objects or scenery, not moving characters. This brings us to one other point. A questionable convention of the horror genre is that a threat is invisible to the characters as long as it is invisible to the audience - that is, when the threat is off-screen. With ScreenX almost literally showing audiences the entire surroundings, the only way to hide the Nun beyond the edge of the frame would be to have her at the back of the theatre - which would make it almost impossible for her to sneak up and surprise a character on the front screen. The film overcomes this obstacle by cheating: the Nun appears from the edge of the center screen's frame, without appearing on either side screen. Sometimes there is an obstruction to block the audience's view of the side screen, acting as a hiding place; other times, the Nun simply appears, as if she were invisible until she got to center screen. It's not exactly playing fair with the audience, but it works. The Nun is not a great film, but it is more enjoyable than it should have been. It is heartening to see filmmakers working in a classic style, milking such old-fashioned elements as a creepy castle and relying on atmosphere to create a sense of supernatural menace that goes beyond mere physical danger. The jump-scares may strike like clockwork, but they provide payoff for the shivery moments of apprehension when characters wander through shadowy hallways where things absolutely must go bump in the night. As a prequel, The Nun is pretty much a bust, telling us nothing that enhances our understanding of The Conjuring. Amusingly, the biggest link comes at the end, in one of those moments that feel like a set-up for a sequel but which really ties into something in the previous film. Overall, the narrative of The Nun might have worked better if not burdened with these unnecessary add-ons. On the plus side, The Nun does show audiences everything necessary to understand the connections; prior knowledge of the other films is not necessary. Just go, turn your brain off, and enjoy those ScreenX thrills. The Nun is currently in theatres nationwide, including ScreenX engagements at the CGV Cinemas LA on Western Avenue in Korea Town, Los Angeles, and the CGV Cinemas Buena Park 8 in Buena Park. The Nun is not much of a prequel, but it does provide more mindless fun than expected, especially when the scares are enhanced by the new immersive ScreenX format. THE NUN (2018). Warner Brothers, September 7, 2018. 96 mins. Rated R. Directed by Corin Hardy. Screenplay by Gary Dauberman, from a story by James Wan & Gary Dauberman. With Demian Bichir, Taissa Farmiga, Jonas Bloquet, Bonnie Aarons, Ingrid Bisu, Charlotte Hope.